“A long time ago, there lived a human being who always went out of his way to help the people of his village. “When the elders could no longer hunt for themselves, he would bring them food. “A young couple getting married could count on him to help make their tipi poles and gather the hides needed to cover their lodge. “If a child’s family was killed, he would take that child in and raise it as his own. “And there were many more good deeds he performed that no one knew of, because he never sought praise or attention for his actions. Every day he remained alert to what he could do to help his tribe, and he did so with good humor and enthusiasm. “Many years went by in this way and all the while the Creator watched this man and took note of his virtues. “There are many uses for cedar — it stays green year round, so it can be gathered and dried at any time. Burning dried cedar on coals creates smoke and we can pray with that smoke — it carries our prayers up to the Heavens. “When children are restless in a home, burning cedar calms them down. “When you just don’t feel too good for hardly any reason at all, you can burn cedar in your home and you’ll feel better. The cedar already knows what’s needed to bring harmony because he was a man who knew how to help people. Cedar is a holy tree to many people across this vast land known as North America (as demonstrated in the story above) and for good reason. Eastern White Cedar or more properly Thuja occidentalis, is a highly populous species inhabiting roughly from Maine to Minnesota and south to southwest Michigan with some satellite colonies as far south as Tennessee. But widely planted as an ornamental. For ease I will only be referring to the wild variety that is not contorted into an odd columnar shape. Typically Cedar can be found growing in what are colloquially known as "Cedar Swamps". These are soggy forest lands where they are able to gain the upper hand and survive where other trees cannot. Cedar trees are not able to cope with too much competition and thus are greater in number in these wet areas. So abundant in fact, that a typical cedar Swamp is around 70% cedar trees. Typical associate trees include Silver and Paper Birches, Black Spruce, White Spruce, Tamarack, Balsam Fir and Red Maple. Each of these tree species will typically inhabit less than 4% of the cedar swamp. 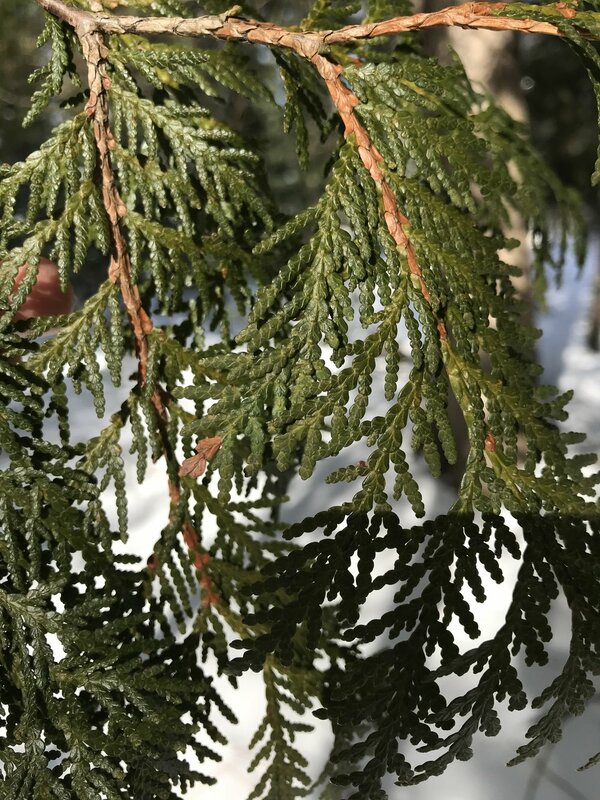 While Cedar is capable of growing with wet "feet" it is also found in great numbers on cliffs and in the sand dunes of western Michigan. The commonality here being that both of these habitats are inhospitable to most tree species. Cedar is a survivor. And sometimes this tree can be an extremely long lived survivor. Notably this one here that is apparently 1,316 years old and can be found on a cliff in Ontario, Canada. Think about that. This tree started life in the year 688. Incredible. Cedar is a small to medium sized tree most commonly growing to a height of roughly 15 meters or 49 feet tall, with a trunk diameter of .09 meters or 3 feet. What a tree is supposed to do and what a tree does are very different sometimes because occasionally the tree reaches heights of 80-85 feet and attains a DBH (that's diameter at breast height) of up to 186". Thats 15 feet or roughly five times the "average". The Bark is ever so slightly reddish-brown or reddish-gray, furrowed, and peels in narrow, longitudinal strips. The "leaves" are in fan like flat sprays that have a very scaly appearance. Almost as if piece after piece has emerged from the one before it. Each little branchlet will have alternating compound leaflet often overlapping the leaflet in front of it ending in one multi-leaflet-containing end leaflet. It sounds very confusing, and in all reality it is! So here is a picture of what it looks like! Notice the alternating and completely complex reality that are Cedar leaves. So we've got what the Cedar trees look like, and where to find it, now lets take a dive into the really interesting stuff, or at least the stuff that really interests me, anyway! The lore and the uses of the EWC (Eastern White Cedar) are so vast that I could fill up a book on the subject. Let us not go that far but instead do a "Greatest Hits" kinda thing! First and foremost, I couldn't write up a blog about cedar without mentioning the oft repeated tale of the "Arborvitae" or tree of life. Jaques Cartier led two voyages to Canada, and it was on the second voyage in 1535-1536 that his men fell ill with scurvy. 25 out of 110 men died of this horrible disease. Being afraid that he would be attacked he was hesitant to reveal to the local native tribe that he and his men were sick, however as the time went on he had to seek help, and help did come, in the form of tea. At first, many of the men refused to drink the tea thinking it poison, however the few that did try it became healthy again within a few short days and the rest of the crew soon followed suit. Jaques Cartier, being saved by this miraculous evergreen decided to call it Arborvitae or the tree of life in French. It is often repeated that this tree that saved them was a cedar tree, however we actually do not know the identity of the actual "Tree of Life". For one thing, Jaques Cartier never described the tree in detail, besides saying that it was an evergreen, and that it was as big "as any oak in France". The second complication is that the tribe that told him the name "Annedda" in reference to the Arborvitae was the Iriquois, but when later frenchmen returned to the same location later on they found Hurons living there and they had no knowledge of the word the frenchmen kept repeating. In reality, the Tree of Life could be Cedar, but we cannot be certain. If you want to get really nerdy about this topic go here. The fact is that Cedar trees do have a crapload of vitamin C. No matter if it is the tree of life or not. Living in this modern world of year round vegetables and fruits we don't need to drink cedar tea or any other evergreen tea to stave off scurvy, but it wasn't so long ago that scurvy affected large portions of the worlds populations. We often take for granted the knowledge that we have at hand, like the knowledge that having Vitamin C is crucial to human survival. In the past nobody had any idea what caused scurvy, but people did know things that helped out with this mysterious disease, and the leaves of evergreen trees were on that list. At least among the tribes of northern north america. To make a tea worthy of staving off scurvy you will need a good handful of cedar leaves, a pot, water and access to a heat source. First bring a pot of water to a boil. While the water is heating up cut up the Cedar into smallish pieces (you don't have to get too crazy). Once the water is boiling, turn off the heat, then add the cedar and cover for five to seven minutes to let steep. Strain and enjoy a scurvy free body. This is my method, but there are folks out there that boil the leaves in changes of water. 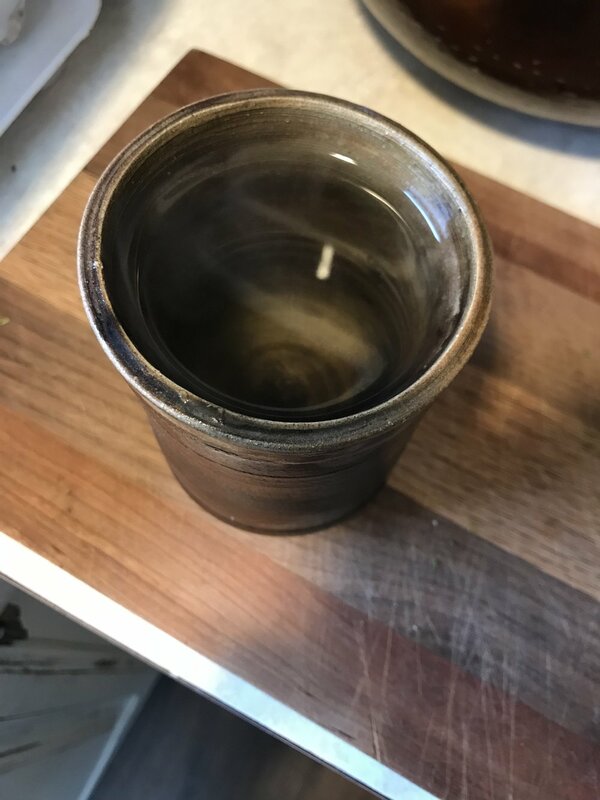 Served in a beautiful clay cup made by my lady! Whichever way you choose there is one thing you should remember: Cedar tea should never be drunk more than one cup per day. Cedar is a safe and very effective medicine, but its medicine will soon become poison if this one simple rule is avoided. Cedar contains Thujone which is toxic to the human body in large doses. Even Jaques Cartiers men were only taking their medicine every other day, and they had full blown scurvy! That often repeated saying that "the dose makes the poison" is a good adage to keep in mind when consuming Cedar tea. If I were to give you some not-approved-by-the-FDA advice I'd say to not drink more than three cups per week. This is a medicine we should use as needed. Cedar is not however toxic when applied externally, and cedar oil is a wonderful bug repellent! It is said to be excellent for wart removal as well as being good for muscular aches and pains. The external uses for this plant are vast and have plenty of rich history here in North America. As one of the 4 sacred medicines of the Anishinaabe tribe, Cedar (or Kiizhik in Anishinaabemowin) enjoyed a wide variety of uses. The external or topical uses include: poultice of powdered leaves applied to swellings; poultice of powdered, rotten wood used for rashes and skin irritations; branches used in steam baths for fevers; leaves and twigs burned for incense in religious ceremonies; used as a deodorant; burned as a disinfectant to fumigate a house for smallpox; decoction of plant tips used as a foot bath for rheumatism; decoction used as a wash or poultice for cuts, bruises or sores; used as a wash for weakness in the hips due to an untreated broken coccyx, and so on for about another 50 or so remedies from varying tribes within its historic range. Tiribal information comes from this book. Cedar wood, and bark should not be forgotten when talking about this subject. Cedar wood is weak, but from a woodworking standpoint it has many qualities that go above and beyond just strength of wood. Firstly, Cedar splits lengthwise perfectly along growth rings allowing for one to make any number of rot resistant projects. Great lakes tribes, and later the French, utilized Thuja Occidentalis wood to produce splints for birch bark canoes. Not only does Cedar work in a canoe due to its flexibility and ease of splitting into splints, but also because it is extremely rot resistant. This rot resistance led to the later development of the white cedar shingle that is still manufactured today for old timey roofing! Cedar bark projects need not only be confined to the inner bark either. The outer bark can be bent and shaped into many varieties of containers. From food storage to arrow quivers, I have seen no end to the fascinating things done with the outer bark of Thuja occidentalis. In a world dominated by plastic and cardboard, one is hardly challenged to need a container these days, but in the past these things meant the difference between an easy day and a hard day. Imagine collecting all of your food from the landscape with no container to place it all in and you will soon see my point! I find that while the necessity of container making is in short supply, my desire for beautiful containers is in great supply. Having access to the wonderful Cedar tree is like having access to a primitive craft supplies store. The final and most fascinating subject (that I will write about today anyway) is the fire making ability one has if one has access to dried White Cedar wood. Most of us that live within its range do have access to dried wood in the form of dead limbs. These limbs can be broken off the tree and split into an easy hearth board for creating fire with a hand drill or a bow drill. If you have never seen someone make fire in an ancient way, I urge you to get yourself over to your nearest ancestral skills school and see it in real life. The satisfaction of seeing a handmade fire is like no other satisfaction I have ever known. Our kinship with fire goes back a long way. There are those out there, and I am among them, that believe having fire at our disposal made us the humans we are today. I believe that the deep satisfaction of watching fire be born, is due to our everlasting companionship with it. Our perennial love of "Caveman TV" as a roommate of mine once called it. Cedar is indeed a magical thing to have nearby. The tree gives us so much and asks of us very little. Only to not take its landscape away. I think that this is something worth fighting for. I heard recently that every single day 600 acres vanish in the face of our never ending appetite for "progress". If in the future you want to have a Cedar swamp you can wander about in, contemplating existence, or just daydreaming, then I urge you to do what you can to protect public lands! Don't let people build over habitats, otherwise trees such as Cedar will be a distant memory, and we will never have this beautiful tree to inspire us. Thank you so much for reading this blog. If you have made it this far do me a kindness and share this with others. If you feel extra giving and you want to help support me in my quest to spread knowledge then you can either: Click through any link on my website that takes you to Amazon (like my recommended foraging stuff page) and make your regular purchases once you have gotten to Amazon. I will get a small percentage of whatever you buy at no cost to you. Or you can get really crazy and go on over to my Patreon page and pledge a small amount of money to help support this crazy foraging fool from Northern Michigan! You can find that link right here. Again thank you so much for all the love and support y'all give me each and every time I write a blog! Have a blessed day!